An easy order system data flowchart maker that helps make order system data flowcharts with free templates. Quickly and easily create order system data flowcharts in minutes. Discover why Edraw is the simplest and easiest, yet most powerful order system data flowchart maker: Download it Now. 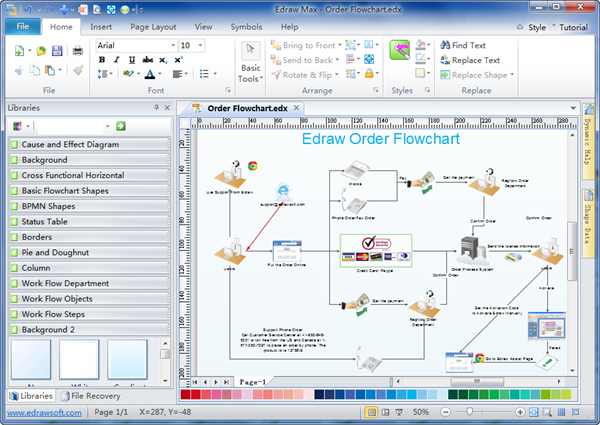 Edraw order system data flowchart maker is a full-featured and easy-to-use diagramming program. It is designed as a self-teaching tool with dynamic help saving you the learning curve. With the interface which most users are familiar with, and the vector symbols and professional examples, even beginners can create presentation quality diagrams by simply dragging and dropping shapes. Adding the finishing touches requires only selecting the built-in designed themes. Transferring the finished order system data flowchart into a presentation or PDF needs only one click on the export button.